The FOCUS SAM was left pretty much untouched over the last five years – but this has changed now. With its modern geometry, the F.O.L.D. rear-end and 170 mm of travel the second generation of the FOCUS SAM wants to do exactly what the old version was – only better. We&#8217;ll tell you how the new enduro rig from FOCUS performs on the trail. FOCUS SAM | 170 mm/170 mm (f/r) | 13.00 kg | € 5,999 The most striking update on the new FOCUS SAM is the F.O.L.D. rear-end which FOCUS first implemented on their all-mountain-rig the JAM in 2016. From now on the SAM will benefit from all of the advantages of the F.O.L.D. kinematics too. A &#8220;two-phase characteristic curve&#8221; is the main idea behind this concept. In the first phase – up to a 35% of SAG – the characteristic curve is degressive and should therefore ensure a sensitive response. In the second phase from 35% of SAG upwards the curve becomes progressive and gives the rear-end sufficient reserves to deal with big stuff and fast-consecutive hits – the interaction between FOCUS’ MAINLINK and GUIDELINK rockers allows for the unique characteristic curve. Since the links are placed directly on the shock the rear-end can be built from one single piece. This significantly reduces the unsprung mass and since the shock and the rocker are sitting in a low and central position it also allows for a lower centre of gravity – as it should be. The new SAM is aimed especially at those bike-park riders who don’t shy off big jumps and drops and always dare looking for playful lines even on the toughest terrain. The new SAM has now 170 mm of front and rear travel and comes exclusively with 27.5&#8243; wheels. According to FOCUS this wheel size should provide all the manoeuvrability and agility you ever need. 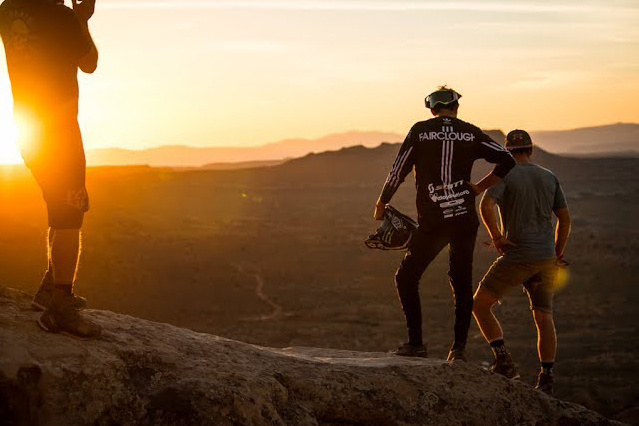 Team riders Olly Wilkins and Geoff Gulevich took it to the next level and rode the massive jumps of the Audi Nines Event showing us what the new SAM is really capable of. The main frame offers enough room for a bottle cage – unfortunately size S frames can only accommodate small bottles. Tall riders and long-geometry aficionados will be disappointed to hear that the SAM is only available in the three sizes: S, M and L. Compared to its predecessor the new full carbon frame of the SAM is 400 g lighter and our M-sized test bike only weighs 13 kg. Finally some waterA bottle holder can be mounted on the down tube of the new SAM FOCUS SAM 9.9 in detail The second generation of the FOCUS SAM will be available in two versions. 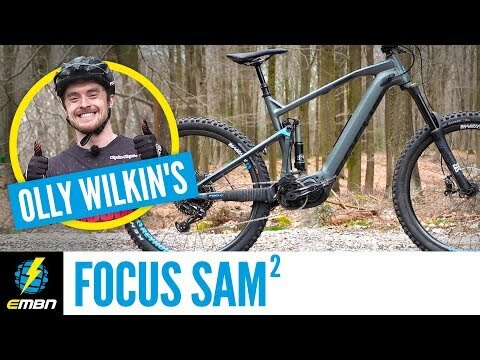 We tested the FOCUS SAM 9.9 which retails at € 5,999 and comes with a full carbon frame. This version features a RockShox Lyrik RC2 fork with Charger 2 damper which works extremely sensitively and swallows even the nastiest of knocks. A RockShox Super Deluxe RCT shock controls the rear-end and beautifully harmonises with the fork. Same as with the cheaper model the FOCUS SAM 9.9 features a SRAM GX-Eagle groupset. Fork: RockShox Lyrik RC2 170 mm Rear shock: RockShox Super Deluxe 170 mm Brakes: SRAM Guide RSC Drivetrain: SRAM GX-Eagle Seatpost: RockShox Reverb Stealth Stem: BBB 55 mm Handlebar: BBB 780 mm Tires: MAXXIS HighRoller II 2,5” (vorne)/Maxxis DHF 2,5” (hinten) Wheels: Race Face Turbine The heartThe F.O.L.D. rear-end of the JAM is now also used for the FOCUS SAM Interesting choice!The Minion DHF at the rear… … and the Maxxis Highroller II on the front might look a bit odd at first glance. The combination actually works really well 750 mm instead of 780 mmThe strong bump at the end of the Race Face grips steals a good 3 cm of bar-width A set of SRAM Guide RSC brakes takes care of the braking – in our opinion the more powerful CODE RSC model would suite a bike in this category better. The weight difference of 1.5 kg between the two versions is ascribable partly to the carbon rear-end and partly to the light Truvativ Descendant carbon crankset. Both bikes run a MAXXIS Highroller II tire in the front and MAXXIS DHF on the rear, both in 2.5” width. Nice and quietThe long chainstay protector gets rid of annoying chainslap noises ClassicThe internal cable-routing ports and the striking top tube have become a design feature over the years FOCUS SAM 8.9 The more affordable version of the SAM 8.9 retails at € 3,999 and features an aluminium swingarm and FOX suspension combo with a 36 FLOAT Rhythm fork and FOX VAN performance shock. A set of SRAM Guide R brakes are in charge of stopping the bike and a SRAM GX-Eagle groupset takes care of the shifting. Fork: FOX 36 Float Rhythm 170 mm Rear shock: FOX Van Performance 170 mm Brakes: SRAM Guide R Drivetrain: SRAM GX-Eagle Seatpost: Kind Shock E30-i Stem: BBB 55 mm Handlebar: BBB 780 mm Tires: MAXXIS HighRoller II 2,5” (vorne)/MAXXIS DHF 2,5” (hinten) Wheels: DT Swiss E1900 The geometry of the new FOCUS SAM As far as the geometry goes the FOCUS SAM wants to be &#8220;long and flat&#8221; in a modern way. However the Germans deliberately renounce the sort of extreme geometries we’re used to see from brands like Pole, NICOLAI or Bold – the chainstays are therefore super short with a length of 428 mm. At 64.8° the head angle is one degree slacker than its predecessor; This is meant to inspire confidence especially on steep and fast terrain. The reach has increased by 8 mm and is now 460 mm on a frame size L. However the new SAM gained a whole 2 cm of stack. Since the bike is relatively short both on paper and in real life we recommend you choose the larger size if you’re an experienced rider and happen to find yourself right in between sizes. Size S M L Seat tube 400 mm 425 mm 450 mm Top tube 581 mm 603 mm 623 mm Head tube 106 mm 115 mm 130 mm Head angle 64.8° 64.8° 64.8° Seat angle 75° 75° 75° Chainstay 428 mm 428 mm 428 mm BB Drop 13 mm 13 mm 13 mm Wheelbase 1,170 mm 1,195 mm 1,221 mm Reach 420 mm 440 mm 460 mm Stack 600 mm 610 mm 623 mm The FOCUS SAM 9.9 in the wild As soon as you swing your leg over the saddle the FOCUS SAM makes you feel at ease! Straight away the centred riding position and low bottom bracket inspire tons of confidence. As soon as the trail steepens-up and the chain is under tension the SAM proves that it can also climb pretty well – even when riding longer climbs you won’t have to deal with annoying bobbing or tiresome loss of power. If you push forward the saddle a little you’ll sit comfortably above the bottom bracket and won&#8217;t get the feeling of pedalling from behind. When the climb gets really steep and technical however the short chainstays and high stack of the SAM become a drawback. Why? The front wheel lifts off the ground. &nbsp;Once you’re sitting on the FOCUS SAM you feel at home! On the downhill the FOCUS SAM feels very agile and playful. Instead of heavily dragging itself from corner to corner the SAM feels lively and playful, nimbly shredding through corners and quickly following direction changes despite its 170 mm of travel. Thanks to RockShox’s superb suspension combo the SAM feels like it’s glued to the trail and delivers good traction in combination with the Maxxis tire-setup. The DHF at the rear is particularly enjoyable – this may not be the ideal option for long pedalling sections on tarmac but calls for well-controlled power slides on the trail. The F.O.L.D. rear-end of the FOCUS SAM gave us a bit of a headache on our test-trails: If you leave the shock compression in the open mode the rear end works sensitively and responds to the slightest imperfection of the trail. Unfortunately this also causes the rear-end to rush through its midstroke with bigger hits and when riding corners with lots of compression. But as soon as you take off a few clicks of compression the rear-end loses sensitivity. After one day of testing we found our sweetspot at 30% of SAG with 4-5 clicks from open. 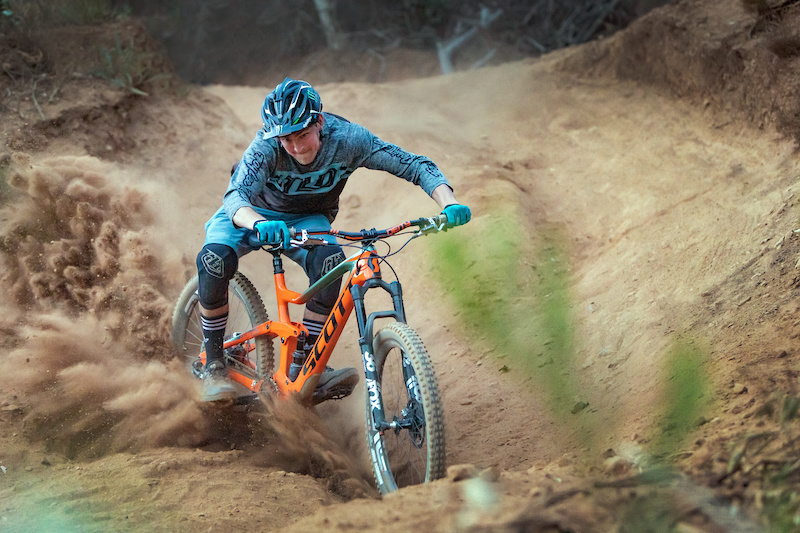 &nbsp;With the FOCUS SAM no jump is too big, no drop too deep and no highline too high When riding berms and flat corners you feel nicely centred and firmly integrated between the wheels – the low bottom bracket is mainly responsible for this. Having said this you should still be very careful; the lively character of the SAM causes it to quickly react to steering inputs in corners. We would have loved to have a little more stability especially when cornering. The FOCUS SAM feels particularly comfortable on long bike-park sessions with large jumps, nasty drops and tall berms. 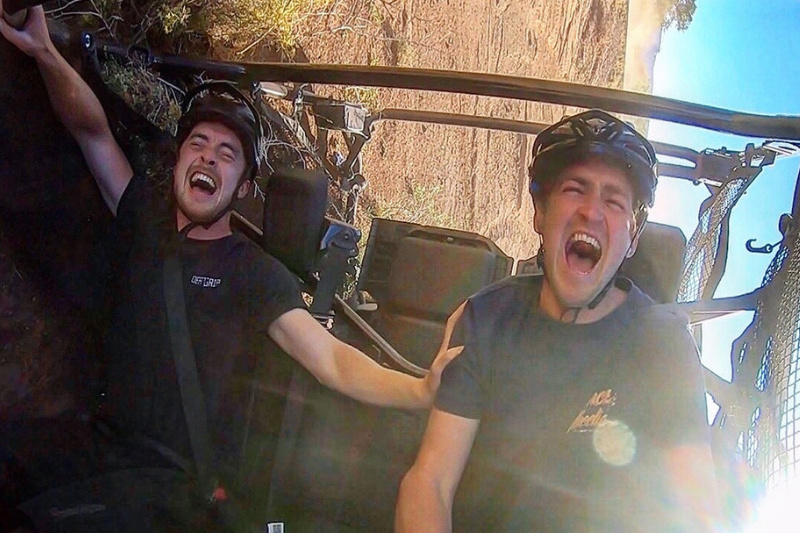 In these scenarios the SAM’s progressive rear-end and airtime-predisposition will put a massive grin on everyone’s face. With the new FOCUS SAM no jump is too big, no drop is too deep and no highline is too high. Availability Both FOCUS SAM 9.9 and 8.9 will be available from mid-September for respectively € 5,999 and €3,999. Conclusions The new FOCUS SAM is the successful evolution of a classic. With its many clever details it will put massive grin on the face of all bike-park riders and airtime lovers And with its drive-neutral rear-end the SAM won’t kill you when the lift isn’t working. If you’re looking for your next race bike the FOCUS SAM might not be the right choice – the lack of stability in high-speed sections are mainly responsible for this. Considering the price tag of the respective versions we would have expected a higher-quality spec. Strengths – Weight – Suspension – Fun-factor! 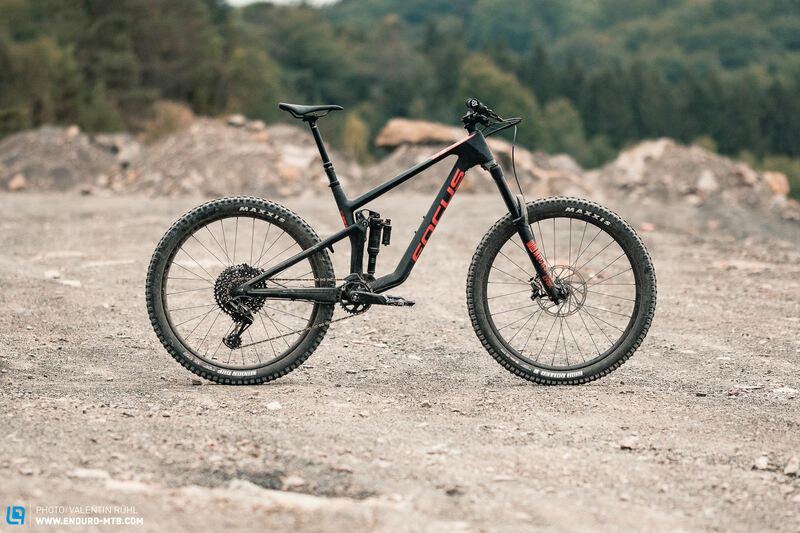 Weaknesses – Composure – Price – Only available in three sizes For more information head to: focus-bikes.com The post First Ride Review – FOCUS SAM 2019 appeared first on ENDURO Mountainbike Magazine.